Maya Williams loves math and science, but that wasn't the only passion that drew her to Hofstra. "I loved that Hofstra had an extremely competitive dance team. Being on the team freshman and sophomore years was an amazing experience." She got to be part of the Super Bowl warmup crew at MetLife Stadium, and also traveled to Orlando twice to compete in the Universal Dance Association national championship. As Maya got deeper into her program at the Fred DeMatteis School of Engineering and Applied Science, she switched to Danceworks, a student-run performance club that required less of a time commitment than the team. "I think it's vital to always continue doing something you love." Maya moved off campus after her sophomore year, which led her to become a Welcome Week leader for commuting students. "I think it is super important to get commuters involved in the Hofstra community. I got to show incoming freshmen all the options they have so they don't leave campus right after class." 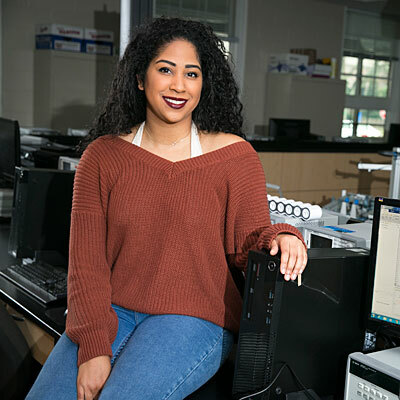 In her junior year, Maya participated in the DeMatteis School's Co-op Program and worked at LiRo Engineering, where she helped design HVAC systems in health care facilities. "Doing the co-op gave me the competitive edge I needed." Maya has already landed a full-time job – she'll start as a mechanical engineer at Henderson Engineers, a national firm, after she graduates. "With the co-op and the mechatronics classes I took in preparation for my senior design project, I definitely feel prepared to enter the workforce."